Congratulations! You deserve the recognition! I have been a fan of yours from afar for several years now and I am amazed at all that you are able to accomplish. I have often wished that you could come to Valdosta, GA and do a workshop for my department…you are awesome! 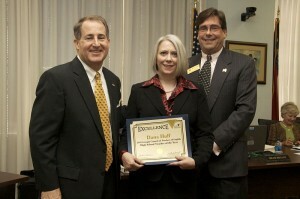 Dana, I'm so glad that you were recognized at the DOE board meeting. They contacted us to get the winners' addresses, and then we did not hear anything else from them. Do you have pictures of any of the other English teachers who were recognized with you? We'd love to use them in our GCTE member newsletter if you do and would give us permission. Anyone who wants to see other pictures of the event can find them at the GA DOE's Shutterfly page.